I hope my readers won't find this too sad a story for the week before Christmas, but hopefully it is a timely reminder of those who are less fortunate than ourselves at this time of year. As I sat having dinner at the Royal Society in Carlton Terrace a few weeks ago, listening to eminent mathematicians discussing the future of science education in this country, I couldn't help but ponder the fate of my own gg grandfather, Edward Clifford, himself an eminent mathematician, who had succumbed, at the age of 48, to a fatal accident just yards from where I sat. Approaching the Christmas festivities I am reminded that this fatal accident took place on Christmas Eve 1848, although Edward died a few days later in Charing Cross Hospital. But what a sad way to end a life. Fatal Accidents: On Thursday. Mr Bedford, the Westminster coroner, held two inquests at the Charing Cross Hospital. The first was upon the body of Edward Clifford, aged forty-seven. He was a mathematical teacher, and lately resided in Chapter Street, Westminster, and was possessed of great abilities in his profession. Last Thursday the deceased was seen to alight from a cab, when opposite Drummond's Bank, and to lean against the railings for a few minutes. Whilst in this position some boys passed, and made some jeering remarks. This appeared to enrage him, and he attempted to pursue them, but unfortunately, before he had gone half a dozen paces, he fell off the pavement into the roadway. At that moment the carriage of the Mexican Ambassador was passing, and both wheels went over his body, by which several ribs were found to be broken and the collar-bone dislocated. Deceased lingered til Sunday, and then expired. The cause of death was inflammation of the lungs. Verdict: "Accidental Death". The accident took place outside Drummond's Bank, 49 Charing Cross (near Trafalgar Square, London - see 1877 picture left). This has since has been rebuilt and can be seen here with its Drummonds sign over the door (even though it is now owned by the Royal Bank of Scotland) on Google Street View. 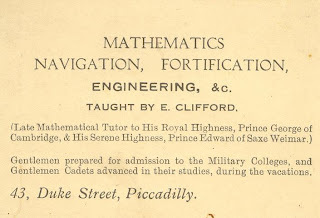 Edward Clifford had, in his relatively short life, published several mathematical papers, taught two royal princes (grandchildren of King George 3rd) and fathered four boys, including my great grandfather, Edward Clifford. Edward junior was only six years old at the time of his father's death, so it was hardly surprising that I was misinformed by relatives, about the name of my gg grandfather. In fact, my gg grandmother remarried, a Thomas Newland, a few years later, and Thomas obviously became a father-figure as far as Edward junior was concerned. 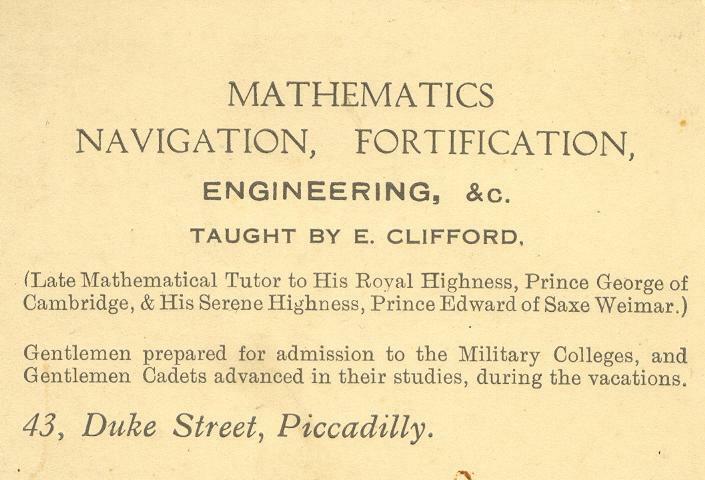 I won't go into the details here of how I finally made the connection that this Edward Clifford, mathematician, was my gg grandfather, but suffice it to say that the inquest report to which the newspaper article referred provided all the proof I needed. Oh my. That is sad, but there is a lesson to be learned too. Really sad and informative post, Rosemary. Touching that all these years later you were near the site of the accident so close to the time of year it happened, and for a maths discussion too. That is a remarkable incident. Very interesting. Must have been a sad time for that family. Thank you hummer, The Amateur Casual and Carla for your comments. I think it was actually rather sad as Edward had already been made bankrupt and he may have been quite miserable. The maths discussion I was listening to was actually a new master of an Oxford College talking about the future of higher education - very topical in fact! A very sad tale - but as a genealogist I have to say it is fascinating that you were able to find the details about his death. Amazing that you were so close at that particular time too - I do think that we do occasionally touch (usually without knowing it) our ancestors' lives. Very sad indeed. It is amazing that you were able to track him. My condolences to your family. I believe the incident to be a bittersweet moment. It might have caused you to lose a family member but it taught a lesson to all who would hear of the story. I'd suggest the families to look into www.deathletters.org. The grieving process is a long and painful one but knowing someone is going through the same thing gets it a little less difficult.